When I worked in Aylesbury in the 1980s, there was a fantastic surgeon at Stoke Mandeville Hospital with a highly skilled team, who operated on new-born babies with cleft lips, usually within 48 hours. Mr Desai felt that there were bonding issues and a need to have the baby looking better before the arrival of the grandparents, which were worth the associated risk. I watched several operations one morning with awe and admiration. He had the cricket on the radio and a tremendous air of respect for the fragile head cradled in his left hand. He operated on their palate at 3 months. This wasn't the case elsewhere in the country who left it to a much later, safer time. I read with interest, therefore, about the recent findings of some American specialists who have decided that early surgery, pre-natal diagnosis and well-coordinated care by a team of specialists is 'vital'. Cleft lip and/or palate -- which occur in the first trimester of pregnancy when the roof of the mouth fails to fuse properly -- affects more than 7,000 babies born in the United States each year and is the second most common birth defect. The figures here in the UK are around in 1 in 700 babies. Women planning to become pregnant should take 400 micrograms of folic acid a day. Pregnant women should not smoke and should avoid secondhand smoke. Pregnant women also need to tell their doctors about any prescription or over-the-counter medications they are taking or planning to take, since certain medicines can cause or increase the risk of birth defects. 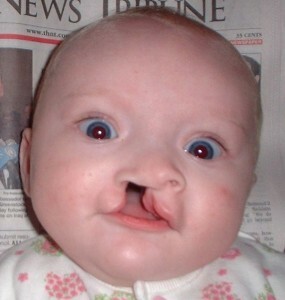 Patients with a family history of cleft palate should talk with their GP about a genetic link.